Often times, in the work at home communities, you’ll hear people talking about their eggs. They are referring to the jobs that they do from home. You’ll also often hear the old saying of “Don’t put all your eggs in one basket”. This saying is a very wise one when it comes to working from home, because of the fact that as an independent contractor you are all on your own. The company you are working with may decide one day that they no longer need your services and suddenly you have nothing. There is no such thing as job security it seems in this crazy work from home world. So what do you do when one morning you find an e-mail that says your contract is terminated or that you are no longer needed? What does one do when their egg has fallen and shattered? 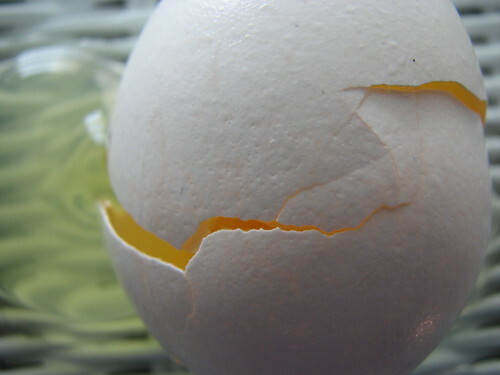 I remember the first time my egg shattered, it was March of 2006 and I had been working from home for just about a year. I had been working with a company called WEST as a virtual call center representative. I loved my egg and I sat upon it daily hoping to see it hatch into a profitable lifestyle but it was also my only egg and I loved it. I didn’t understand how so many others could juggle their time between multiple eggs, how they managed to sit on so many different nests and manage to still have time to live any sort of life outside of work. I woke up to find that dreaded e-mail that I was no longer going to be working with their company, effective immediately. There was no explanation as to why, no closure, nothing. I tried to e-mail and call to find out what I had done wrong and all I got was the reply that they owed me no explanations. I did the usual things that we do when things go wrong, I panicked over the loss of money, I cried and grieved over my shattered egg and I tried to figure out what I was going to do next. I picked up the pieces and I started over. I visited forums like workplacelikehome.com and wahm.com to see what kinds of eggs I could find to fill my little nest. I took up a new motto, “when one door closes, a window will open”. I searched, applied for everything, and found a new work at home call center job. Once I got settled and was working making money again, I began to understand the idea of having more than one egg, I have never stopped looking for something new. This past year I had a total of four eggs sitting in my basket, one fell out with a major crash (it was totally unexpected) and another I let fall out because it just wasn’t a good fit for me. Intelichek worked well for awhile but it was a phone mystery shopping job and it didn’t work well with my thin skin. I felt ok letting this one go though because, although it brought in some good money, it had down times and therefore it wasn’t a reliable enough egg to worry about. The other job, I loved it, truly enjoyed working it on a daily basis. I would log into the system, find a question for ask.com and answer it. For every answer I was paid 34 cents, not a lot but it added up to a good $50 to $60 a week minimum. Then one morning I received an e-mail that the entire site was going down permanently and that they would be sending final payment. I was saddened and I was angry, this was one job I would truly miss. Even now, nearly a month later, I still miss this particular job! On the plus side, it showed me how much I truly enjoy writing and how cool it would be to get paid to do it. So, what do we do when our eggs shatter? We grieve some losses and we are content to let others go away, almost as if it were a relief to not have to sit on that uncomfortable nest any longer. We pick up the pieces of our shells and sometimes we find that our egg has hatched a new dream inside us. We learn from our shattered eggs and we become better people than we were before. We realize that shattered eggs are just a window opening into a whole new world. We spread our wings and take flight into the wide open spaces of the work at home world. Open Discussion- What Is The Best Thing About Working From Home? Deb is a work at home mom and wife living in Massachusetts. She enjoys snowboarding in the winter, fishing in the summer and candlepin bowling with her son all year round. Deb is a hard worker who wants the best of both worlds and is searching for the perfect job she can do from home. In her ideal world, she can schedule her work around her life because that's the way it should be. I just recently stopped writing for wiseGEEK altogether, and that was an “egg” I had been depending on for a long time. It was painful for me to do, but I felt really strongly that it was the right thing. I really enjoyed reading this! So true. I remember the feeling I had when I chose to completely let go of Liveops and canceled my phone line and did not sign my contract renewal! I was so relieved to be done with phone work. But nervous that it was really the end of something I depended on so much! Things have worked out and I am making more than ever and happier than ever as well! Jess you are doing the right thing and will succeed! Thanks for the encouragement Miranda. You’re a true friend. Hello, Miranda. You are right, as freelance workers, we must always be looking for that next job. I’ve been fortunate for quite a while to have steady work … until a year ago last March. It was devastating. I found myself depending mostly on one job, since the income was so great. I knew in the back of my mind it would eventually end and they would no longer need new content, especially since I was cranking out 40 articles a month for them. It was a cushy job where I finally sat back on my laurels and thought I’d take it easy for a while. It ended abruptly in late March 2010 and I wasn’t ready with other lucrative work. I knew better. I’d always been proactive before, but not this time. What did I do, though? Like you mentioned in this post, I looked longingly at the shattered egg, grieved over the loss of it and moved on to find a variety of other eggs. As a freelance writer, you have to be constantly looking for work, even when you have too much already on your plate. In that case, you could always keep a reputable writer friend or two (I have some on which I know I can fully depend) on hand to help out for the short-term.